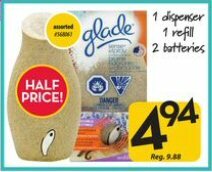 Giant Tiger has the Glade Sense & Spray Starter Kit on for only $4.94 starting today through March 20th! Well here are some awesome ways to score with this deal! Checkout 51 has a $5.00 rebate on this starting midnight tonight for $5.00 = FREE. Also websaver.ca & save.ca have a coupon good for $5.00 off so if you ordered your coupon back when I posted it you can go pick up this Sense & Spray starter kit for FREE and possibly score $5.00 FREE! Either way its all free!! Grab your coupon now at www.websaver.ca & www.save.ca if you haven’t already.